I have to confess a couple of things that I haven’t quite figured out how to replace since becoming a mage. First, I haven’t found a spell more situationally effective than a well-timed threat. But that’s probably true for most professions. Beyond that: ricotta cheese. I can’t do without it. I know people who swear by tofu or cashew replacements. I keep trying them, but none quite hit the spot (though if you’ve found a good one, tell me about it! Seriously, help a mage out!) I’ll keep looking, but I still use it in the mean time. On a lighter note, mutant zucchini are inevitable in a world of busy gardeners. They go from tiny fingerlings to megaton-bomb-sized monsters overnight, but they’re notoriously flavorless on their own! On the plus side, zucchini and marinara sauce go together like two halves of a cheesy 90’s friendship necklace! Grab the giant zucchini that your friend brought to the office, and bring in the leftovers, because seriously, with a zucchini the size of a baseball bat, this recipe easily makes two batches! The recipe here calls for ricotta, because it’s what I know and have the most experience with, but if you’ve got a better summon that uses plant magic, DEFINITELY use it here. You could even be bold, and do without. Try doubling the mushrooms if you do! Any pasta sauce would make this recipe faster, but if you feel like upping your protein (and vegetables!!) I recommend using my red lentil marinara sauce. It’ll help make this dish more filling and add some nutritional complexity. It uses a little more than half a batch of the sauce. Since the sauce freezes well, use half on this and freeze the other for later! Do yourself a favor and don’t ignore step 1. Using one of the biggest zucchini I’d ever seen, I dumped two cups of water out of the bowl that the zucchini was draining in- which can make the difference between a good texture and a clean oven, or soup with a burnt mess! Line a colander with paper towels. Place zucchini in a layer and dust with salt. If necessary, place additional paper towels between layers of zucchini. Cover with another paper towel and let sit for 30 minutes. Put a bowl under the colander; this will make a whole lot of water appear. Saute mushrooms in a little oil, add salt and pepper. When nearly completely cooked, add spinach or kale, and wilt for a few minutes. Once the greens are wilted, remove the pan from heat, and stir in ricotta. 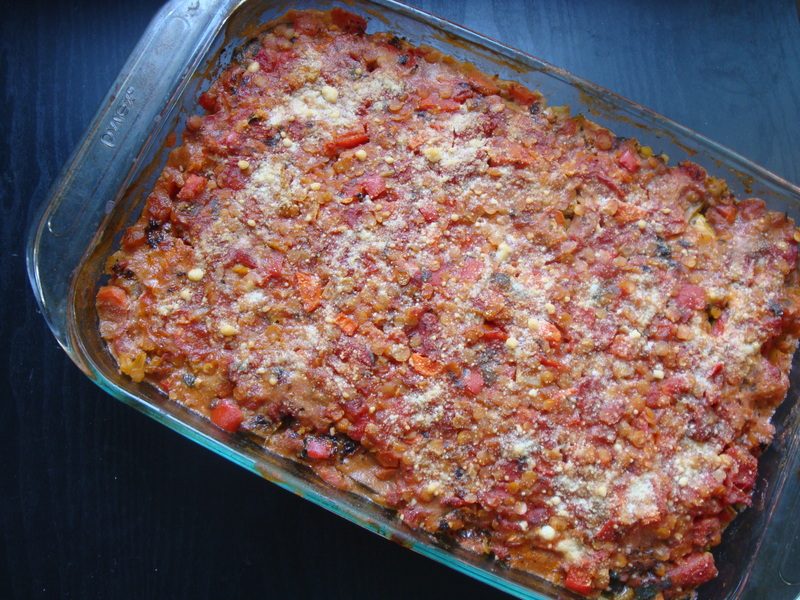 In a large, greased casserole dish, place a layer of zucchini slices. Top with a layer of sauce, then another layer of zucchini. Add entire batch of ricotta mixture, and spread evenly. Top with a layer of zucchini slices. Add another layer of sauce, a layer of zucchini, and top it with the remaining sauce, dust with parmesan, and bake uncovered for 35-40 minutes. Place a baking pan under the casserole dish to catch any spillover. This entry was posted in comfort food, Magic Upgrade, powerful & potent and tagged comfort food, dinner, DIY, great leftovers, healthy, homemade, Veggies. Bookmark the permalink.